Unique compact preamp/amp/speaker system that fits into the soundhole of your acoustic guitar. No modifications required. Includes battery pack, adapter battery charger and 2 x 9 volt rechargeable batteries. Includes box and manual. Unique compact preamp/amp/speaker system that fits into the soundhole of your acoustic guitar. No modifications required. Includes battery pack. FREE adapter battery charger and 2 x 9 volt rechargeable batteries. *BRAND NEW* Includes box and manual. 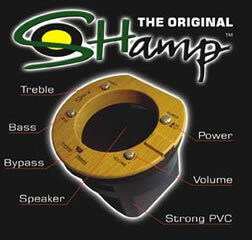 Enter your email address below to get alerts for Shamp.